Get plans and illustrated, step-by-step instructions that will help you create beautiful improvements to your backyard and landscape: fences, a trellis garden gate, pergolas, an arbor, a tree house, a water garden, patios and walks. Build A Picket Fence Here's a fence for those who refuse to buy off the rack. Its elegant design features a distinctive cap rail over the picket tops, and the easy-to-build cedar box posts are topped off with classic turned finials that you can buy. How To Build A Classic Backyard Fence, by Neal Barrett If you just want a fence to keep out the neighbor's dog, there are plenty of off-the-shelf choices at your local home center. If, on the other hand, the idea of defining your personal landscape with a touch of architectural flair grabs your imagination, you've come to the right place. Garden Gateway: Build a Trellis If you're looking for a project that enhances your outdoor environment, the easy answer is a deck or patio. If, however, you want something just a little more captivating–a subtle focal point for your garden or yard that accents your landscape rather than covering it up, we have a few ideas for you. 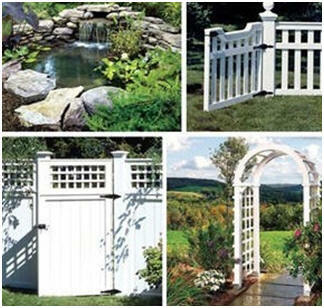 Made of solid redwood, this garden gateway features four distinct designs–trellis, gate, fence and bench. Each element complements the others so that, taken together, they provide a cohesive assembly of form and function. How to Build a Garden Arbor - A Simple DIY Woodworking Project Use step-by step plans to make a classic latticed arch gateway. 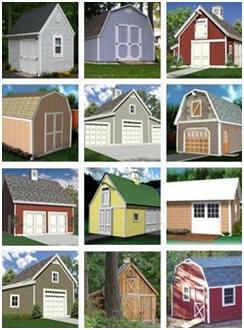 This guide includes 3D animation and master-level blueprints. Build a Pergola That's Perfect For Your Backyard, by Rick Peters Here's a structure that won't provide shelter from wind or rain, and is only marginally better when it comes to the midday sun. So, why build it? Because in the absence of walls and a roof, it defines an outdoor space without constraining it. It's a unique architectural blend that places you both inside and out at the same time. How to Plan and Post a Perfect Pergola Pergolas can be the perfect backyard oasis, but they're also fun to build. They're a perfect blend of big honkin' timbers, some pretty neat carpentry and a little landscaping thrown in for good measure. Here's how to plan and post a perfect pergola. Build Your Own Pond, by Joseph Truini If you've always wanted a backyard pond, you're not alone. Hundreds of thousands of homeowners already have them and thousands more are installing them every year. Why all the fuss over a water-filled hole? Well, for one thing, gurgling waterfalls are inherently appealing. Also, with the growing popularity of "water gardening," many people look at their ponds as an interesting, ongoing project. Build yours with this quick guide to building a stone-lined, fit-anywhere, good-looking backyard pond. Follow the Weekend Brick Road, by Neal Barrett If you thought brick walks were just for the rich and famous, it may be time to re-evaluate your status in life. A modest brick paving project is a great way to add character to your home--without breaking the bank or calling in a landscape professional. The work is not particularly complicated, and careful preparation will ensure a job that is beautiful and long lasting. In fact, brick walks have been known to last for more than a hundred years. Build Your Own Natural Stone Patio, by Steve Willson A traditional flagstone patio can be a great addition to just about anybody's yard. The material is attractive and durable, and nicely complements a wide range of other landscaping features. Many varieties of stone are available at landscape and masonry outlets. Slate, a metamorphic rock, is one of the best-known types. Bluestone, which is cut in northeastern U.S. quarries, is what we used on this project. It's a sedimentary rock with a very engaging color. When installed, both types yield a relatively smooth, flat surface. How to Build a Flagstone Patio Fast Popular Mechanics' Home Editor Harry Sawyers builds a stone backyard patio in less than 48 hours, using very little equipment but plenty of sand. How to Build a Backyard Treehouse Here's how you can make a world-class backyard tree house. 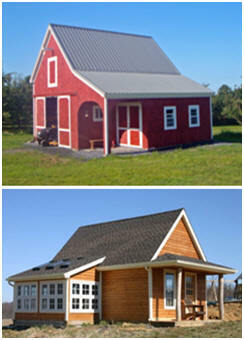 Over the years, Popular Mechanics Magazine has featured a variety of backyard building, home improvement and woodwork projects as feature articles. Now, they offer many of the best projects on their website. These in-depth articles are illustrated with plans, photos and detailed isometric views. They follow the building from the planning stage through final finishing. So, they are step-by-step guides that will help you build the perfect project. See for yourself at PopularMechanics.com.